Of all the skincare and makeup questions I get on social media, dry skin is tops. When you live in a very dry, cold climate (like Canada), keeping skin in a healthy moisture balance is a challenge. Your complexion can become rough, tight and flaky in part because humidity levels drop to very low levels. Skin absorbs most of its moisture through the environment which is why your skin glows when you go to the tropics on vacation. Humidity levels are almost always high in the Caribbean. 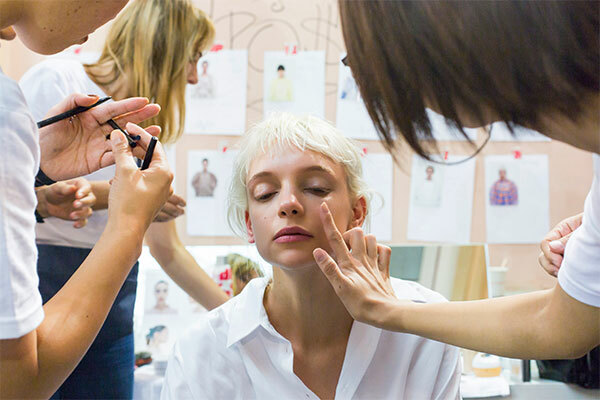 To help us with some tips and strategies for tackling dry skin and makeup, I’ve asked a pair of industry experts at Clarins to share their expertise. Marie-Claude Cote is National Training Director at Clarins and specializes in spa-level skincare techniques. Christine Mann is National Makeup Artist and Trainer and brings her beauty talent. Here are their fascinating answers to the most common questions I get. Dave: To start, what is dry skin and what are the symptoms? Marie-Claude Cote: Dry skin reflects a lack of sebum. Poor in lipids, the hydrolipidic film present on the surface of the skin becomes too permeable and loses its valuable moisture. Since the skin is poorly protected, it becomes dehydrated. Dry skin looks fine and feels tight. It can become sensitive and easily irritated, and may develop imperfections such as redness or scabs. I find my clients describe it as feeling tight or itchy. You may have dry skin patches in different places that are red, wrinkly, dull, and rough. If you have dry skin, you will probably not be able to see your pores in that area. Dave: How do you approach makeup for someone who has very dry skin in a very cold and dry environment like Canada in winter? Christine Mann: Skin care is the most important part of your beauty routine! Dry, flaky, dull and sensitive skin are words that are common during the cold winter days and often we see dryness in areas like: eyelids, cheeks and forehead and around the lips. Also foundation tends to slip off the bridge of the nose. And makeup doesn’t apply as well to rough, uneven skin. You won’t get the best results from your makeup if skin is too try. Here is how to solve this problem: Start by applying a day hydrating cream, based on your needs. I then recommend using a hydrating primer to create that perfect canvas. Skin is plumped and even and ready for foundation. Stick to a richer foundation with moisturizing ingredients and leave your tinted moisturiser for the summer. I also like to use brushes to apply my foundation. It minimises flaking, as brushes are more gentle than your hands. Marie-Claude: If you have dry skin you can look for creams that are a bit thicker to wear during the day. A thicker cream will also give you a dewy and healthy look. Dave: Are primers important in winter? What about facial oils? Christine: Yes! I love mixing my double serum or sandal oil in my foundation. You simply add a few drops to your foundation to help improve skin’s dryness. It will also definitely give a dewy finish to your foundation which will look a lot healthier. Dave: Do hydrating masks help during very dry, cold months? Marie-Claude: Yes, a hydrating mask will definitely help. Ideally, you should apply it after exfoliation, as the skin is more receptive afterwards. It should be applied once or twice a week; more often if needed. Dave: What should you avoid when choosing products for dry skin? Marie-Claude: You should avoid choosing a product with retinol, peroxide, alcohol or salycilic acid. Choose a creamy texture and use it immediately after you shower or bathe. Applying a cream will create a layer of oil that locks the moisture in your skin. The water will not evaporate, and your skin stays hydrated. Dave: How do you best treat dry lips before applying lipstick? Marie-Claude: Use a replenishing lip care product with hydrating and protective ingredients to nourish, moisturize and protect lips throughout the day. The skin on the lips is the only skin that does not contain oil glands so you need to moisturize throughout the day. Dave: Which lipstick formulas work best? Christine: During the winter I recommend using a formulation that’s acts like a baume or oil on the lips. Dave: How can you tell when you need to change your makeup or products to address dry skin? Christine: For me it’s when I start heating my house and start making fires. That’s when you know it’s TIME!!! And when your foundation looks flaky and seems to not stay on, it is time to adjust your skincare and makeup. With a few tweaks you can have glowing skin and beautiful makeup year round. Thanks for the informative interview! So many great tips and tricks. I do love the Caribbean when my skin glows and so moisturized lol! Thanks for the tips, they are great. Thank you for the wonderful information!! Thank you! I have even more problems with dry skin than ever in my life because I am going through the ‘change’. I had no idea I could add oil to my foundation, I can’t wait to try it. Thank you so much for all this info. It will help me so much. My skin is so terribly dry since I’ve gotten older. Much appreciated Dave. Great tips, Dave! Thank you so much! super helpful tips, thank for this article Dave! !